« Believe it or not….. So, in the effort of catching up my writing to my reading, I am going to mash various things together — things, which actually are all connected. My currently reading (badly outdated) had listed my current reading as Asimov’s Bicentential Man (that’s right, it’s not all about Amazon) and Scalzi‘s The Ghost Brigades. Since then I have re-read William Gibson’s Neuromancer and also added Warren Ellis’s Iron Man: Extremis and Grant Morrison’s WE3. So as you can see, I stayed busy while I was away. All of these pieces share a similar focus (to greater and lesser degrees) on the combination of the artificial and the natural. Hence, they all have cyborgs or some sort. 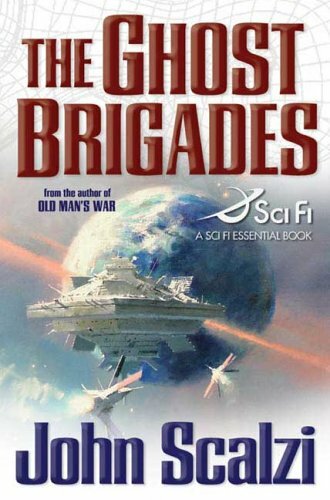 The Ghost Brigades: I covered this briefly in an earlier post but I really enjoyed this sequel to Old Man’s War. And, I want to add more but to be honest I just can’t get started. The current question I am wrestling with regarding this novel is how much it stands alone. I am thinking about teaching it this Fall and I am curious if it will be ok by itself or how much prep work from OMW I will have to do. My sense is that it will be fine. It seems that Scalzi works in the background information in various place — and quite deftly I might add. I never felt that..”blah, blah, blah” feeling one sometime gets with sequels when they try to catch readers up. But, if anyone has not read either and is willing to read TGB first and tell me how much they think it stands alone, I would be eternally grateful. Ok, not eternally but certainly for a least a semester. Neuromancer — when I first read this novel, I loved it. And, then I reread it. I still felt it was very good. It actually, in my opinion, suffers from its own success. So many later works are influenced by (or to put it more harshly are derivative of) this novel that it doesn’t re-read as well as I would have hoped it would. What was a burning desire for all things Molly in the first read but merely infatuation in the second. I guess I’ve seen too many similar characters. It is still a must read to achieve any sense of SF literacy. 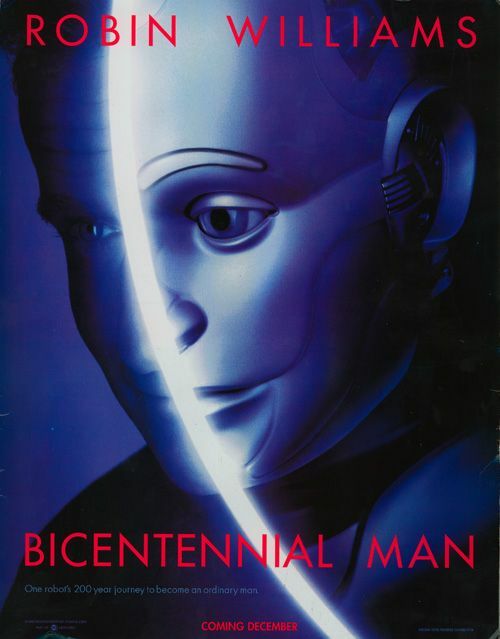 “Bicentennial Man” — Yes, if this sounds familiar, it is because there is a movie adaptation of it. Yes, the one with Robin Williams. But, before you run screaming to the next little blurb. The movie is actually based on the novel The Positronic Man by Asimov and Robert Silverberg, which is itself an adaptation of the novella by Asimov. Although I haven’t read the novel, the essential difference between novella and movie is the love interest plot — in that it is missing from the novella. Both the film and the novella trace the robot’s journey to be recognized as human by those around him but more importantly legally. As such, it is a great exploration of what it is that makes us human. I know it seems a pretty simple question but it gets hairier when we try to actually put it to words. Assuming we don’t take the easy religious way out and say “soul” — something which while I may or may not believe we have, cannot be seen or in any way measured thus making it entirely possible that the annoying frog croaking in my neighbor’s water garden at the moment may indeed have one too. Anyway, I won’t spoil the end of the novella but Asimov’s definitions of what legally allows the main character to be human is fairly interesting. Iron Man: Extremis: Wow, hat tip to Amy over at Amy Reads for the recommendation of this trade when I was visiting their town back in May. The basics are that Tony Stark converts the under-structure (they have a specific word but you get the idea) to become part of his body — stored in his bones and emerging through his pores. 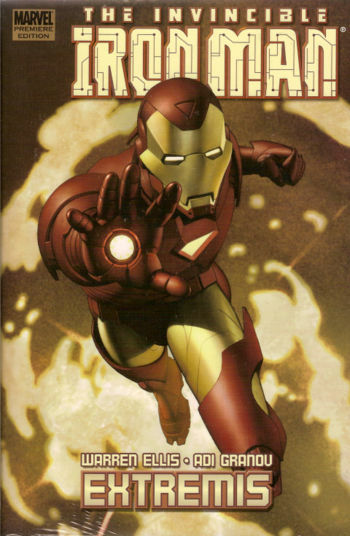 It effectively makes Stark a cyborg as the Iron Man suit becomes part of him. Other than the Stark’s seemingly innocent and definitely mousy long-lost friend is actually the bad guy part of the plot, I really enjoyed the trade. That “twist” was a little too pat and telegraphed really badly with the whole — “it takes two keys to open the vault” line. But, what it did really well was engage the question of military applications for funding and the importance of the military in funding issues — making it not a version of but closely enough related to the recent, excellent movie to complement each other well. We3: I read the first issue of this trade way back when it first came out and I put it down (for dialogue reasons if memory serves). 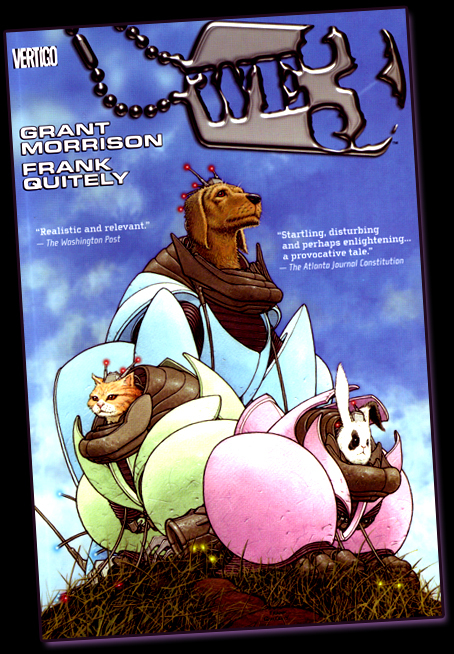 But this wacky re-envisioning of The Incredible Journey as three common pets (a dog, a cat, and a cute wittle bunny) escape from their research facility where they have been cybernetically weaponized and take the journey home. Again, an interesting examination of the role of military and technology and the multiple implications of that research on human both in terms of using the device and being on the more business end. My only concern was the quite graphic nature of the art. I certainly get that that is part of the point. Cute little fido ripping some dude’s head off is part of the satire. But, I am not sure how it will fly in the classroom. This entry was posted on July 9, 2008 at 10:10 am and is filed under Uncategorized. You can follow any responses to this entry through the RSS 2.0 feed. You can leave a response, or trackback from your own site. Holy crap; two posts in a row! Are you sure you don’t want to pace yourself?